More from Alev Karagulle at Burgess as she sends word that the 43.4m motor yacht Waterlily is now a central agency listing for sale. Built by Royal Denship to Lloyds class and completed by Southampton Yacht Services in Summer 2009, Waterlily has seen very little use and is offered in 'as new' condition. This superyacht boasts superb guest spaces inside and out with a modern, light and spacious interior. MCA compliant, she accommodates 10 to 12 guests in a master suite, two double and two double/twin cabins plus two Pullman berths. 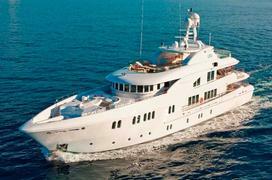 The asking price is €17.95 million.